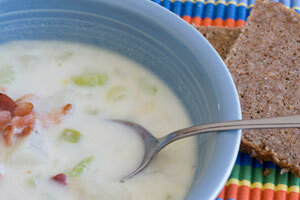 This Irish Potato Soup Recipe makes a satisfying meal. This is an Irish potato soup recipe that my mom, Elizabeth, wrote for a simple and satisfying meal. She recently made a batch that my sister and I enjoyed with her. Give this potato and leek soup a try! Peel four firm baking potatoes and cut into cubes. Put potatoes into saucepan and cover with water. Add a little salt and boil until potatoes are slightly tender. Add a thinly sliced leek which was thoroughly washed. Cook until potatoes are tender. Do not drain. Add milk to cover potatoes and then add an additional cup of milk. Sprinkle 2 tablespoons of flour into the potato and milk mixture and stir. Stir until blended and simmer until thickened slightly. Slightly mash part of the potatoes. Garnish the potato soup with crispy bacon crumbles and shredded cheese. Serve with brown bread. Enjoy!